While I mostly focus my blog on hammock-related gear, I’m a backpacker at heart and love a chance to try out items related to this hobby. When I was contacted to try out Trail Foody, I eagerly accepted. 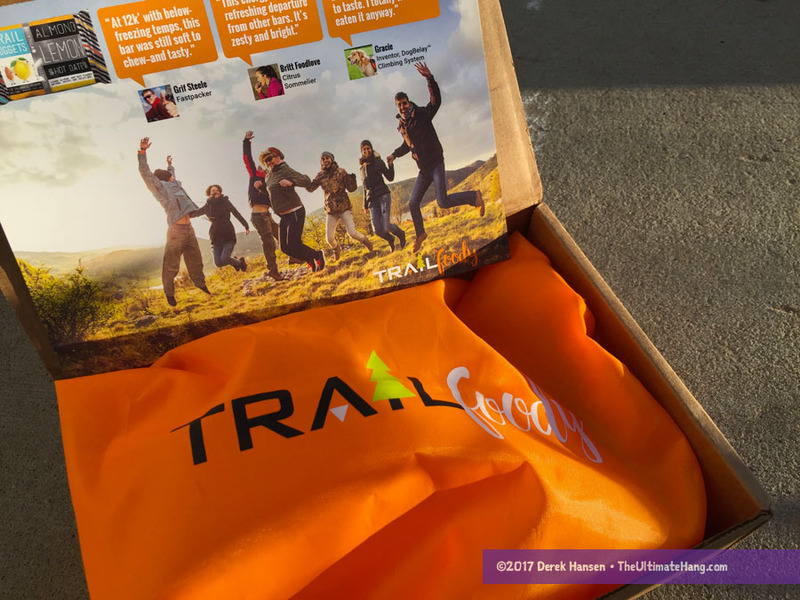 Trail Foody is a box subscription for trail snacks! The company offers different subscription packages, but the base “Wanderer” package is the common denominator. It comes with a small orange stuff sack filled with a variety of healthy trail foods that pair well together. The total calories range from 700 to 1400, depending on what is supplied. You can skip a month whenever you need, and you can change or cancel your plan at any time. When talking with the owners, you don’t have much choice in the selection of the snacks, so those with specific allergies of food intolerances take note. That said, the company is focused on picking premium snacks that are USDA-certified organic, vegan, BPA-free, non-GMO (when possible), gluten-free, and local sourced. The concept is that you will receive an initial box containing a bright stuff sack with the snacks inside. Future boxes would contain refill snacks. The selection would be random, but always hand-selected and designed to pair together. The snacks are designed to replace 1 or 2 meals depending on your trip type or caloric need and can be spread over as many trips or nosh stops as preferred. I love the concept of box subscriptions, although I like to have a little more input in the selection. That said, I did enjoy the opportunity to be introduced to products I’ve never tried before. For some of the snacks I liked the most I read the backstory for the company and was impressed by the various methods used to create them. Trail snacks are always hard to buy off the shelf for me because they can be expensive and I worry I may not like them. Trail Foody takes some of the worry off your shoulders by giving you a selection that’s curated monthly with recommendations from the owner. To try out the snacks, I went on some hikes and even took my son as a tester. We had been hiking on empty stomachs and after a few miles we were ready for a good snack. We set up a hammock and lounged in some shade while sampling. It was fun to pop open each bar and share the time together enjoying the scenery. Kate’s Stash Bar (2.2 oz / 270 cal / $2.99 ea) — A little crumbly, but held together to eat okay. It was a tasty bar with good filling calorie count. I love dark chocolate, and the flax seeds really add the hearty texture I look for in a homemade bar. This bar didn’t taste or feel factory made. Trail Nuggets Lemon Almond Hot Date (2.1 oz / 210 cal / $2.50 ea) — The lemon came out stronger than I was expecting, but I liked it. It had a good consistency and filled me up. Crafted Energy Bar (1.8 oz / 210 cal / $2.99 ea) — This bar was a little dry and crumbly, which made it a little tricky to eat. Still, it had a great combination of flavors and ingredients like dates, oats, agave, cherries, pupkin seeds, ginger, coconut oil, pineapples, dates, almonds, blueberries, and flaxseed. Sqwincher Qwik Stik ZERO 20 oz (0.11 oz / 0 cal / $0.40 ea) — An easy favorite we’d like to try again. The smal “stik” fit easily in our small-mouthed reusable steel water bottle and after a quick shake we were refreshed with a tart lemon-lime drink. Zero calories but good electrolytes (45 mg) and sodium (55 mg). HuppyBar Chocolate Berry Love (1.7 oz / 190 cal / $2 ea) — A dense fruit, seed, and nut bar. The bar was moderately moist. I’m not sure I loved the flavor combination, but it was palatable and I would willing to try other flavors. Mama Chia Chia Squeeze Blackberry Bliss (3.5 oz / 70 cal / $1.56 ea) — Fun, full-flavored squeeze. Not a lot of calories, but a lot of Omega-3’s (1200 mg). The texture felt like semi-liquified Jello-O with a lot of seeds for texture. Organic Prairie Mighty Bar Uncured Bacon and Apple (1 oz / 70 cal / $3.33 ea) — The label description sounded mouth-watering, but I was disappointed in that the flavor and texture were nearly identical to any number of mass-produced beef sticks. Sadly, I tasted neither bacon nor apple. The outside of the meat had what felt like a casing. I was really hoping for a more “homemade” texture and feel, so while the beef was USDA-certified organic and grass-fed, the processed taste and texture sort of let me down. Late July Mini Cheddar Cheese Sandwich Crackers (1.1 oz / 150 cal / $4.40 ea) — Probably my least favorite of the bunch, these crackers tasted identical to the cheddar cheese Ritz Bits cracker packs. I guess I was hoping for a deeper flavor, more bite in the cheddar, or a more hearty grain in the cracker. The main advantage here is that Late July has no synthetic pesticides, artificial colors, flavors, or preservatives. Overall, I liked the selection. To me, trail food is always more palatable when I’ve been hiking, but some of the bars I would consider bringing on a pack lunch at work or a road trip. Even those items on the “bottom” of my preference list have advantages over their more processed counterparts. The subscription model provides the convenience of getting a package without much hassle or “convenience” charges. The stuff sack is a nice touch, although I’d love a gym-style bag that could double as my hike bag.